Sensodyne Extra Whitening | Glaxosmithkline Plc. It not only relieves the pain of sensitive teeth, it gently breaks up stains to get the teeth whiter, and is as gentle on tooth enamel as regular toothpaste. 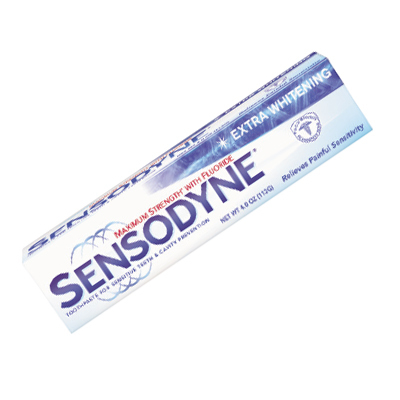 Sensodyne toothpastes contain ingredients that relieve the pain of hypersensitivity within 2 weeks, and is the only desensitizing toothpaste with forms and flavors to keep teeth sparkling clean and breath minty fresh.